DETROIT -- Aisin Seiki Co., the massive Toyota Group supplier of transmissions and powertrain components, is looking long term, and the company doesn't necessarily like what it sees. Its biggest customer, Toyota Motor Corp., aims to all but eliminate traditional gasoline engines by 2050. And with that goes Aisin's signature product, old-school gear boxes. That's why President Yasumori Ihara is now reinventing the company for a new age. His multipronged strategy focuses on a host of new products and new segments, including hybrid drivetrains, inverters for electrified cars, vehicle control systems for self-driving cars and technologies for connected vehicles. The rollout will be slow, but it starts next year. "Once EVs and electrified cars are introduced, what happens to transmissions?" Ihara wondered out loud at the Detroit auto show. "It's about how to protect revenue." Aisin's diversification is partly due to Toyota's plans to phase out traditional internal combustion engines through 2050 as part of a push to slash emissions. But it is also a response to universal trends toward electrified vehicles and self-driving cars. Aisin aims to build new revenue streams in those areas to counterbalance falling sales in traditional segments. Part of the plan is shifting away from the company's overreliance on Toyota. 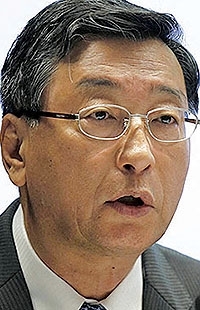 Sales to Toyota, Aisin's top shareholder, are expected to account for 61 percent of Aisin's global revenue of ¥3.43 trillion ($29.62 billion) in the current fiscal year ending March 31. That's down from about 70 percent a half-decade ago, Ihara said. But it is far from his goal of balancing revenue streams at half from Toyota and half from rival carmakers and other sources. The other part is reducing Aisin's reliance on transmissions, which account for about 45 percent of its revenue. That share could drop to as low as 25 percent by 2025, Ihara said. The shift begins next year when Aisin will introduce a new one-motor transmission for hybrid vehicles, Ihara said. He declined to name the customer, but the technology was developed as a low-cost eco-transmission for passenger vehicles in emerging markets. Aisin also aims to expand its sales of inverters. It currently makes an inverter only for use in a hybrid commercial vehicle sold by Toyota's truck-making subsidiary Hino. Aisin hopes to catch Toyota Group rival supplier Denso Corp. in supplying the component to others, Ihara said. Aisin is also moving into the hot fields of self-driving and connected-car technologies. It is developing a vehicle dynamics control system to help automatically steer a car away from potential collisions by integrating actuators controlling the brakes, steering and suspension. Ihara said it will hit the market in two to three years and first be deployed in a Toyota vehicle. Also on the self-driving front, Aisin is developing a valet parking function that will allow a car to park itself in a lot while the owner stands outside the vehicle controlling it with a smartphone. The car will patrol the lot by itself until it finds an empty spot, then park automatically. Aisin aims to introduce the valet technology within two years, first in Japan. Aisin has already partnered with a parking enterprise to develop lots for its introduction, Ihara said. Finally, Aisin is targeting connected-car functions such as driver-snooze detection and systems that automatically tailor cabin settings, such as temperature and seat adjustment, to passenger preferences. Ihara said those could arrive in another two to three years. The new businesses that Aisin targets account for almost zero revenue today. But ambitious Ihara said they could contribute as much as 10 percent of the company's overall sales by 2025.